California Highway Patrol are investigating reports of a body found on the side of the road near Bandy Canyon Road in Escondido, officials said. 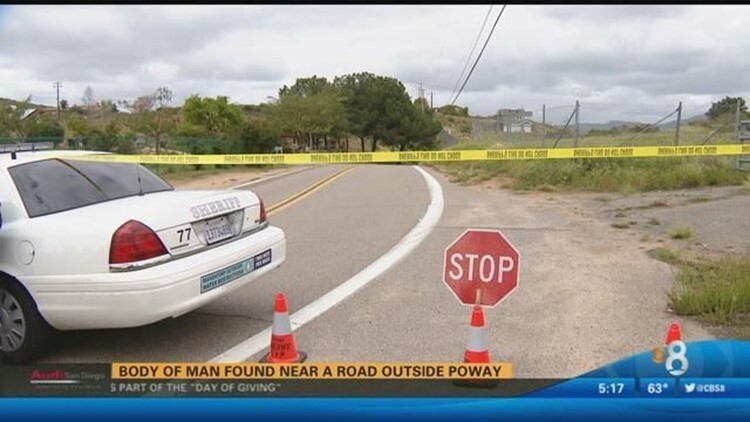 POWAY (CNS) - A 47-year-old man's body, showing signs of decay, was found in the unincorporated area near Poway Saturday morning, according the San Diego County Sheriff's Department. and that the body had been there for about a week, sheriff's Sgt. Mark Haynesworth said. A motorist in the 15500 block of Bandy Canyon Road called the California Highway Patrol shortly after 11 a.m. to report that her friend had died. Sheriff's detectives responded to the scene, but homicide detectives did not, Haynesworth said. The medical examiner's office respond and the body was taken to the ME's Office in an effort to determine the cause of death. While the man's name has been determined, it won't be released until his family is notified, according to Haynesworth.